Fiction – paperback; Scribner; 320 pages; 2006. 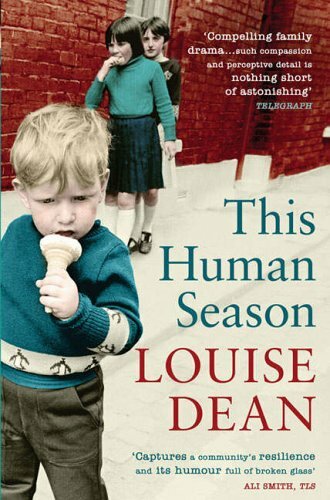 Louise Dean’s This Human Season is set in Belfast in 1979, at the height of The Troubles. Republican prisoners being held in The Maze are mid-way through their “dirty protest” in which they spread their excrement on the walls and refuse to wear clothes. Public support for their demand to be treated as political prisoners, rather than criminals, is building on the outside. Talk of hunger strikes isn’t that far away. Dean gives voice to both sides of the political divide by splitting her rather ambitious second novel into two narratives told in alternate chapters. The first revolves around Kathleen Moran, a Catholic mother of four, whose eldest son, 19-year-old Sean, is locked up in Long Kesh, while the second, has John Dunn, a former British soldier of 22 years standing, now working inside the prison as a guard. This even-handed approach serves to highlight the human tragedies at the heart of this brutal and bloody conflict. Kathleen, struggling to come to terms with Sean’s imprisonment, is at her wit’s end trying to keep her husband sober and her younger son out of trouble with the law. As she helps neighbours and friends pick up the fragments of their shattered lives, who will be there to pick up hers? Meanwhile, John, struggling to put his military past behind him, finds that the high wages he earns as a prison officer come at a price, including the fact that wearing the uniform marks him out as a potential terrorist target. As he withdraws further and further into himself, his relationship with long-term girlfriend Angie is tested to the limit. After he closed the second grille once more, the voices started pitter-patter here and there, now in English, now in Irish. There was something ghostly about it; it was like listening to the voices of men who’d died together, trapped in the hull of a boat or in a building on fire, hundreds of years ago. He couldn’t hear what was being said, just heard the shimmering sibilance of their voices. Even though he was warmly dressed, it was too cold to nod off. It was no wonder they talked into the night, the low voice next door comforting like a coal fire. It is a different country, that’s the first thing you have to get straight. To be honest with you, I’ve got a lot of time for the Catholics. The decent ones. Not the IRA. Although you see their discipline when you work in the prison. Anyway, I like it here, I like that it’s a hard place. England’s not for me, it’s all white bread and keeping the lawn trimmed. I like the people here, for the most part. Some of them are bastards — but you get that everywhere. There’s a lot of fear amongst the Loyalist people that the Catholics will overrun the place. They have six or seven kids, whereas we have the one or two. They don’t want to be British but they’re not above taking the welfare. They’re good at giving to their own, I’ll grant them that, better than we are, everyone round here is for himself. But we don’t want to live their way, and why should we? People don’t want nuns and priests running their lives, teaching their children. Just because a person wants a united Ireland doesn’t make him more Irish than me. You see the difference is we’re happy with our lot. We’ve got our own ways here in Ulster. What we have here, and it’s not very much, we’ve worked for, so we have. Why should we give it away? Let them go down south if that’s what they’re after. It makes for a hugely absorbing and intelligent read, one that lingers in the mind and forces you to think about all sides of the debate. It’s dark, disturbing and absolutely heart-breaking in places. Admittedly, I found it a bit of a slow burner but eventually the atmosphere of this book enveloped me to the point that I thought about it whenever I put it down and couldn’t wait to pick it back up again. Louise Dean’s first novel, Becoming Strangers, won the Betty Task Prize in 2004 and was longlisted for the Booker Prize in the same year. This Human Season, while critically acclaimed, doesn’t seem to have garnered any awards, which is a shame, because this is a truly brilliant novel, intelligently told and one that shows a very human side to a war that raged for 30 years. I read this book when it was first published, before I began blogging, and therefore couldn’t remember a lot of the detail but your excellent review has reminded just why I enjoyed it so much. I thought it was written with great sensitivity and humanity, giving a well balanced view on a complex time. Much more satisfying than the film Hunger for example. I am certainly enjoying this reading and reviewing project, Kim, as it is acquainting me with a number of novels (and novelists) whom I don’t know. Many thanks — and I am sure that I will be sending the Book Depository an order when you are done. The project has revived a thought that I have had before and perhaps you could address it in a post after this reading project is finished. Why does Ireland (or the two Irelands) consistently produce so many good writers? I am not saying that other smallish countries don’t also punch above their weight in terms of writing, but Ireland would certainly seem to be a model of performance. Ordered this book right now, looks great! Love the ‘voice’ in the passages you quoted. You can almost hear the characters speaking the words. I read this book several weeks ago, because I often like to let a book “sit” with me, to see what sticks and what doesn’t, and I found this book to be remarkably “sticky”, if you know what I mean. It hasn’t got a terrific plot at its core, but Dean creates such lifelike people grappling with real problems, so it’s the human element of the story which makes this book work so well. I’ve not watched all of Hunger, only elements of it, because I found it unrelentingly bleak and depressing. I think you’d like this story, Kevin. As I said to William above, it hasn’t got a great plot, but the characterisation is superb and the little tragedies each character grapples with makes it a very human (and empathetic) tale. As to why the Irish are such great writers, I have a few little theories — plus an in-house Irishman to quiz for his views, so I may well do a post as you suggest on this topic at a later date. Hope you enjoy it, Bubba. Not exactly a cheery read (although there’s plenty of black humour in it), but a thought-provoking one. I also gave this book 5 stars – easily the best book Louise Dean has written in my opinion. Although I quite liked Dean’s Becoming Strangers, this book was, as you said, brilliant. There are not too many books that you can put into this category! I am always looking out for another book of hers. I’ve just realised I have read her latest book “The Idea of Love” which again, I didn’t enjoy nearly as much as Human Season. How brave of Louise Dean to tackle a topic on which she has no personal background as far as I can tell – she hails from Sussex and Kent I think and now lives mostly in France. I really must get hold of this one having read your excellent review. Yay, I just picked up a second-hand copy of this for a song! Hooray! Hope you find it rewarding. It’s a pretty dense read but I remember being totally wowed by it. Northern Ireland, by the way, is a beautiful country. I “ran away” there when it was my 30th (this is before I knew Tim) and spent 10 days on a minibus with 11 other people exploring the coast. We had a night in Belfast. The Good Friday agreement was just a year old so the concrete road blocks in the town centre were still there and the “cages” were still on the pub doors (where people were searched for weapons) and we were warned about staying away from certain areas especially after dark, so it still felt a bit dangerous and menacing. The people I were with were exceedingly ignorant and making fun of the whole thing. I’ve never been more embarrassed to be Australian. It was my last backpacker trip. I’ve never done backpacking, and now I know why!